It is not known when Sai Baba was born, where he came from, or who his parents were. The term Sai Baba means simply, Saintly Father. 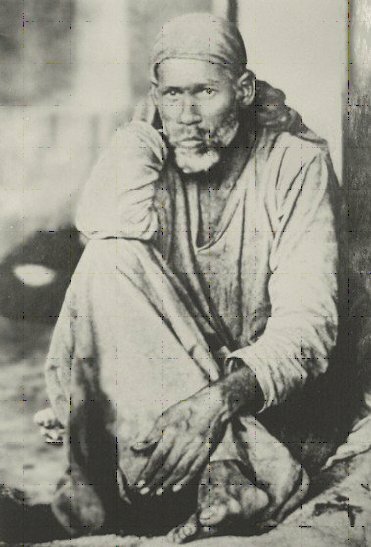 He appeared in Shirdi, which is a little village in India, at about the age of sixteen, and stayed there till the end of his physical life in 1918. Between the years of his appearance at Shirdi, and his transition, his life was an extraordinary succession of miracles and deep communion with his pupils. Like Ramana, he had no need to enter a trance to experience the Unconditional state, but was constantly aware of all things. Through this he would often describe a stranger’s whole life in detail. Curing the sick and childless in miraculous ways happened constantly. One old man, grandfather of a pupil, when led before Sai Baba bowed and said, “Baba, I can’t see.” “You will,” Sai Baba replied. He laid his hands on the old man’s head and he could immediately see. He would, and still does, appear to people in their dreams, either requesting them to visit him at Shirdi, or giving them spiritual instruction. Often these people had never seen or heard of him before, yet came under his influence. As his consciousness had realised its timeless eternal nature, he is still as powerful to help those who turn to him today, as he ever was in his physical body. But the Master, whether in the body or out of it, demands something of us—namely surrender of self to his divine will. Very often, in curing people, he would ask them to let go of their prejudices or self-will. One colourful illustration of this is the experience of Dada Kelkar. Being a strict Brahmin he would not touch onions. Not only this, he hated the sight of them. Having visited Shirdi with a party of people, Dada became enraged when one lady began to cut up onions for her meal. This very much upset the woman. Some hours later Dada’s granddaughter developed a pain in her eyes, and began to cry. Dada immediately went to Sai Baba and asked him to cure it. Sai Baba, who knew nothing of the argument, told him to rub the girl’s eyes with onion. When he asked where he could get the onion from, Sai Baba pointed to the woman he had argued with. Turning to Shirdi Sai Baba, there is little in English of his teachings, but his conversation with a disciple named Nana is a magnificent example of his insight. Nana was massaging his master’s legs, chanting a Sanscrit verse from the Bhagavad Gita. Sai Baba asked him to repeat it aloud. It was “Know that by means of prostration, enquiry and service the Jnanis (Enlightened) who have realised the Truth will teach you Jnana (Knowledge). “Do you understand this Nana?” Baba asked him. Nana gave a literal translation, wondering the while whether Baba knew anything of Sanskrit grammar. He soon found out. “In tatviddhi, what does tat stand for?” Baba asked him. “I don’t see any difference between them.” Nana admitted. Then followed questions to which Nana replied ‘Yes’ in each case.